Η είδηση στο παρακάτω θέμα είναι καταρχήν ότι πίσω από την καινοτόμα αυτή πρωτοβουλία βρίσκεται μια Ελληνίδα, η Μαρίνα Ψυχογιού, και κατά δεύτερον και ίσως σημαντικότερο είναι ο τρόπος και η σοβαρότητα που διέπει την προσπάθεια του Ομάν να αναπτύξει την ιστιοπλοΐα και ειδικά την γυναικεία ιστιοπλοΐα, με το πρόγραμμα που έχει ξεκινήσει με στόχο να φέρουν την ιστιοπλοΐα μέσα στην ζωή των γυναικών στο Ομάν. Για το "Oman Sail’s Women’s Programme" μπορείτε να διαβάσετε περισσότερα σε παλαιότερη δημοσίευση μας που είχαμε μιλήσει με την Μαρίνα. Για το συγκεκριμένο κατόρθωμα των 7 γυναικών από το Ομάν, διαβάστε περισσότερα στο δελτίο τύπου της ομάδας. 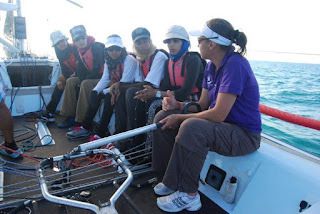 Seven of Oman Sail’s most promising female sailors have just completed their biggest challenge to date, undertaking a 350km trip from Khasab to Mussanah. These seven remarkable women are some of the first recruits in Oman Sail’s new Women’s Programme, an initiative that is bringing sailing into the lives of Omani women. Sailing onboard the 30-foot yacht, Al Thuraya BankMuscat, and coached by Marina Psichogiou and Amy Harrioson, the seven female sailors were selected from 30 trainees who are currently embarking on a six month professional instructors course at Mussanah Marina. The course will qualify Oman’s first female dinghy instructors and forms a vital part of a selection process aimed at finding four Omaniwomen capable of competing in Sailing Arabia -The Tour (SATT).SATT, which takes place in February 2012 will see the women line up against up to 10 international teams, for two weeks of racing around the Arabian Gulf coast.The two night voyage was designed to test the women’s endurance and give them an understanding of the challenges they will face if they are amongst those selected to compete in SATT.Intisar Al Tobi was one of the seven women selected for the trip from Khasab to Mussanah, which saw the women spend two nights onboard. She said: “We were all very excited about it and that was our main drive to take upon the challenge. It was a great experience. During our training sessions in Mussanah, we are usually in the water for a maximum 4 hours, this time we spent 28 hours in the water. We faced some challenges at night, it was too cold, we barley slept 2 hours, it was all about how to adapt to the boat and to the sea and this experience has truly tested our level endurance.”She added, “This trip helped us know more about our personalities, and capabilities and now I look forward to completing the training program and proof to others that we can do it.Intisar’s teammate Raaya Al Habsi also commented: “At the beginning, I was a bit worried about getting sea sick, and the change in weather, but it all went very well. It was an amazing experience! I can’t explain how wonderful it is to be in the middle of the sea under the stars. The voyage tested our ability to work with each other as a team and although we were all exhausted and did not have enough sleep, we all supported each other in performing our tasks. This experience was a true test of our physical and mental fitness and whether we were capable of achieving this. We continued working hard and did not give up, and we were all very pleased to complete the journey with high spirits.”Before joining Oman Sail, many of the women had never dreamed of a career in sailing, and now many are beginning to realise the diverse career and sporting opportunities open to them within the marine industry.Oman Sail will officially announce the Al Thuraya BankMuscat crew before the end of the year. These four Omani women will sail alongside some of the world’s most famous female sailors who have been recruited to train, mentor and guide the women through their first competitive offshore sailing experience.